For comments and questions, please visit our Contact Page. ONT is located in the Inland Empire, approximately 35 miles east of downtown Los Angeles in the center of Southern California. It is a medium-hub, full-service airport with commercial jet service to major U.S. cities and through service to many international destinations. For more information about the airport, please visit our Airport Information page. For other services, select from the menu to see details. Baggage claim areas are located on the ground level of both terminals. Luggage cart rentals are available in the baggage claim areas, in the terminal parking lots, and in the front of the Consolidated Rental Car Facility. Skycap service is available in front of the terminals across from the ticket counters. Terminals 2 and 4 each have two Automated Teller Machines (ATM), one on the Lower Level and one on the Upper Level. The ATMs on the Lower Level, in both terminals, are located across from the Information Desk and the ATMs on the Upper Level are located across from Gate 206 in Terminal 2 and across from Gate 407 in Terminal 4. Our International Terminal (FIS) Facility also has an ATM near the U.S. Customs and Border Patrol (CBP) window on the left hand side as you enter the facility. There is also one ATM in the Consolidated Rental Car Facility (ConRAC). 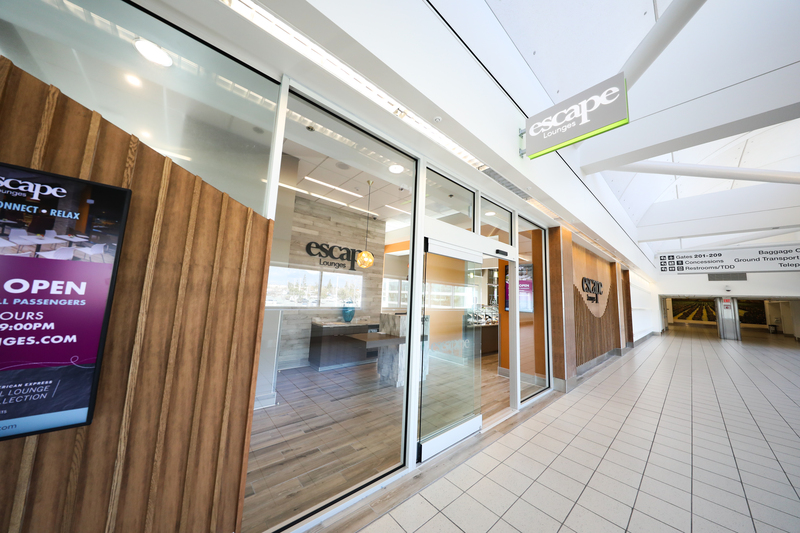 Open from 5 a.m. to 9 p.m. daily, enjoy our Escape Lounge near gate 209. Lounge coming soon to Terminal 4! Contact your airline first if you have a problem with lost suitcases or other items left on board an aircraft. Items left or lost in the public areas of Ontario International Airport, including gate areas or security checkpoints may have been turned into our Lost & Found Department. All Items stored in our Lost & Found Department must be claimed within 90 days, or items will be disposed of. Driver License, ID, Passports and Credit Cards are only held 5 working days then returned to issuing agency or destroyed. Hours of Operation: 7 AM to 12 PM and 1 PM to 3:30 PM. Pacific time, Monday to Friday. The office is closed on weekends and holidays. Terminal 2 – Located on the 2nd floor past TSA screening, across from Gate 207, next to the Women’s Restroom. Terminal 4 – Located on the 2nd floor past TSA screening, across from Gate 407, next to the Family Restroom. The Nursing Rooms at ONT provide a private and secure space for a mother to pump or breastfeed. The rooms were constructed following the California Building Code and comply with federal and state ADA standards. Padded benches and an electrical outlet are provided in each room. The Nursing Rooms are not associated with a restroom but are in close proximity to one. Pet relief areas are located outside and inside the terminals. Outside pet relief areas are located at the far ends of the terminal buildings. Inside pet relief areas are located near gates 210 (Terminal 2) and 410 (Terminal 4). Mission Statement: The mission of Travelers Aid of the Inland Empire is to provide information and referral services at Ontario International Airport. Millions of travelers pass through Ontario International Airport every year. Travelers Aid Volunteers are there to assist them with information to make their way through the airport as well as around the Inland Empire. These ambassadors are very often the first people visitors come into contact with reflecting our airport and community. They play a vital role in customer service at the airport providing a personal touch in the hustle and bustle of traveling. Download an application or call (909) 544-5378 to request one. Please email your completed application to [email protected]. The Ontario-USO lounge is located in the Administration Building (old Terminal 1) across from Parking Lot F at 1940 East Moore Way. There is free shuttle service available from Terminals 2 and 4. The facility has approximately 10,000 square feet of space that features spacious and comfortable television lounges with a library of films and television shows; free library of books and magazines; computers with internet access; game room; luggage storage; children’s area and nursery; "Canteen" snack bar; family room; nap room; international map display area; and outdoor patio area. All services are provided to troops and their families free of charge. Hours are 6AM-10PM daily. The facility will serve more than 28,400 active duty, reserve and retired service members and their families each year.